Location/ Directions: Take 610 to Hwy 59 South. Take Stafford/Sugar Land exit. Travel 1/4 mile and Extended Stay Deluxe will be on your right. About Hotel: 3-Floors, -Rooms, Interior Corridors, Hotel is designed especially for longer stays with studios featuring fully-equipped kitchens and plenty of work space. Kitchen with refrigerator, microwave, and stove-top, Dining and cooking utensils provided, Free Wi-Fi in all guest rooms, Convenient workspace, Free local phone calls, Personalized voice mail, On-site guest laundry, On-site fitness center, Pet Friendly Rooms, Deluxe Coffee Bar Daily, Outdoor swimming pool, DVD player in every room. Railroad View: Excellent View! Any room on the rear of the motel overlooks the railroad. Railroads past Hotel: BNSF Railway. 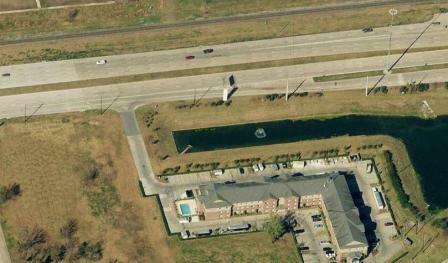 Photo Comment: The railroad can be seen along US-90 near the top of the photo. Rooms that face US-90 will have a railroad view.